As the New Year approached, I found I had some unfinished business left to tackle. One was the AltPick Deck of Cards artist’s promotion project and the other was the Brooklyn Art Library 2012 Sketchbook. My deadlines for both works were fast approaching and I wanted to create new artwork rather than reformatting existing designs. The deck of cards took priority because it is a personal financial gamble designed to inspire new clients. AltPick.com curates a limited collection of cards that feature the works of selected artists in illustration, photography and design. Used for promotional purposes, the decks are sent to design firms, art directors and art buyers who use the cards as a reference for hiring freelance artists like me. I definitely needed my 2012 Trump Card! 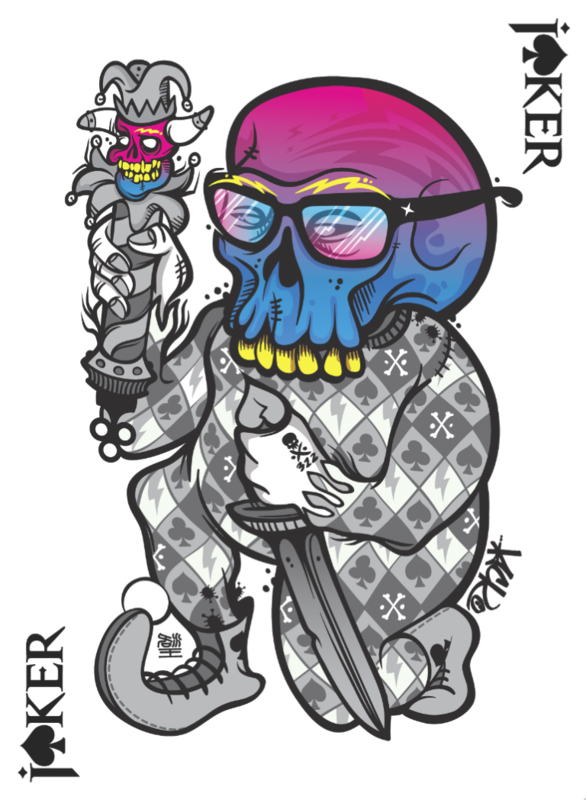 I used the “Deck of Cards” as the inspiration for the artwork and created a visual pun on the Joker in every card deck. I wanted to create a Shakespearean skull like Hamlet’s Poor Yorick, the dead jester whose skull inspires the famous Act 5 soliloquy – a fellow of infinite jest. “Trask-Radio! Trask-Radio!” echoed in my head. With all my jokers in a row, I decided to develop the skull sketches from my AltPick deck and use them for the Brooklyn Art Library 2012 Sketchbook Project. After selecting the best of the remaining skull sketches for the Sketchbook Project, I transferred them to the Scout sketchbook (provided by the Art Library) and enhanced my graphite pencil sketches with a variety of Faber-Castell color pencils, then Indian Ink and finished them with hand cut silhouettes. I wanted to take the sketches I so often use to create digital artwork and transform them with the illusion of motion. I needed to create a 3D pop-up animated flip book out of a 2D traditional paper medium. 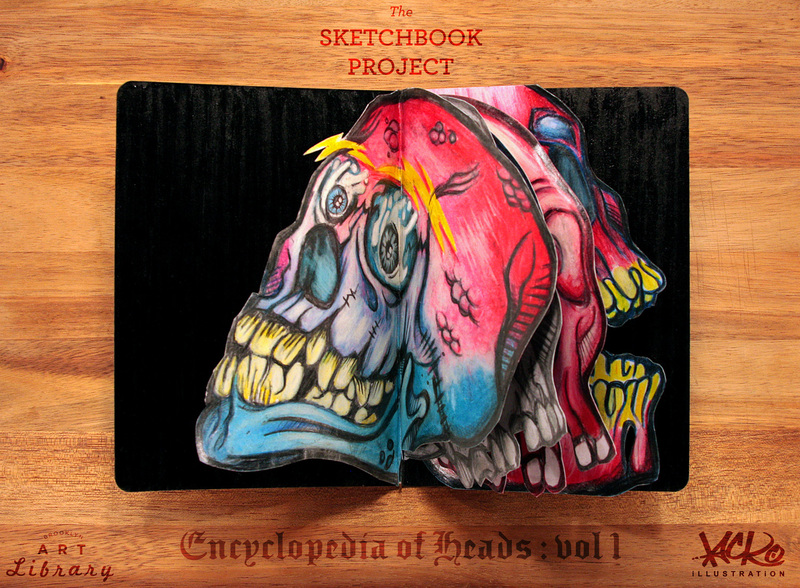 Both the “Infinite Jest”playing card and the “Encyclopedia of Heads” sketchbook are Memento Mori, artistic reminders of our mortality that date back to antiquity. The 20th Anniversary AltPick Promotional Deck of Cards is scheduled for release at the end of May 2012. The Brooklyn Art Library 2012 Sketchbook Project World Tour launched in Brooklyn, NY on April 14th-29th and ends in Melbourne, Australia November 10th-21st. This entry was posted in Altpick, Illustrations and tagged altpick deck, brooklyn art library, infinite jest, john lacko, shakespeare, skulls, trask-radio. Bookmark the permalink. Loved reading your concept development. Thanks for sharing. I also really liked the images. Incredible thinking behind the creative, no?